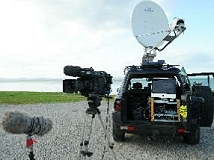 BNN provides IP SNG satellite truck in Scotland. Tain, Scotland, December 2016: BNN Media operates in one of the most beautiful regions of the UK, supplying its clients with broadcast production and live transmission services. Located in the Scottish Highlands, BNN can provide a single camera news crew through to larger scale multi-camera shoots with live broadcast or post event delivery, from Standard Definition all the way through to 4K Super slow motion. BNN - new to promoting its facilities on TVZ - owns an IP SNG truck which is equipped with the Ka-Sat NewsSpotter satellite system. It is also equipped with a Quicklink 4G bonded unit enabling live or recorded reports to be transmitted over the cellular network.